Drawing on the knowledge and experience of working with hundreds the world's top social change leaders in all fields, Beverly Schwartz presents a model for change based on five proven principles that any individual leader or organization can apply to bring about deep, lasting and systematic change. Rippling shows how to activate the type of change that is needed to address the critical challenges that threaten to destroy the foundations of our society and planet in these increasingly turbulent times. These actionable principles are brought to life by compelling real-life stories. Schwartz provides a road map that allows anyone to become a changemaker. 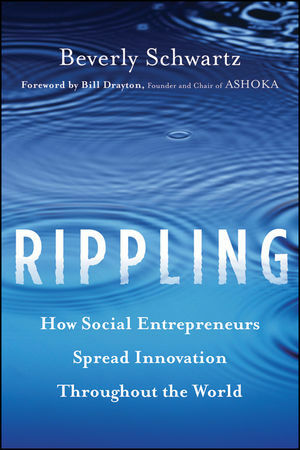 Rippling clearly demonstrates how and when empathy, creativity, passion, and persistence are combined; significant, life-altering progress is indeed possible. Beverly Schwartz is vice president of global marketing at Ashoka, the world's largest association of leading social entrepreneurs. Schwartz is an "entrepreneurial" behavioral scientist and has made her career in the field of social marketing. She has devoted her career to working on some of the world's most challenging societal issues, including smoking and drug prevention, gender equity, educational and environmental reform, and HIV/AIDS awareness and prevention. She holds an MS degree from Queens College, City University of New York. Please visit her at www.changemakers.com/Rippling. How Elektrizitatswerke Sch¨onau works with communities to buy back, manage, and control electric grids so it can replace nuclear power with renewable sources of energy. Changing the dynamics of how and what teachers teach; appreciating the vision of the Center for Inspired Teaching. How the Rickshaw Bank is reinventing the lives and livelihoods of rickshaw drivers. Removing age-old restrictions on women who lose their rights, property, and freedom after the death of their husband; understanding how Women’s Human Rights is changing the face of Asia. Exploring the way Community Enterprise Solutions offers ‘‘a basket of solutions’’ to rural villagers by lowering the cost of economic entry for suppliers. Using technology to connect small-scale farmers with real-time competitive prices; how the Kenya Agricultural Commodities Exchange improves the lives of small farmers. Stimulating local economies by creating a new currency and a system of community banks for low-income citizens; the story of Bancos Palmas. How Ciudad Saludable creates microenterprises around garbage collection and increases the economic viability and positive health outcomes of communities in which they operate. Ensuring a fair price for farmers by transforming global trade practices; the influence of FairTrade USA on American consumers and its impact on families around the world. Building a culture of sanitation and hygiene in crowded urban areas in Africa and Asia; why DMT Mobile Toilets is literally changing the landscape and much more. Applying a quintuple bottom line to eco-housing, Chenelet energizes low-income neighborhoods while creating community with dignity and grace. Equipping a generation of youth to take charge of their financial survival, Aflatoun balances the scales in favor of their future. Redefining disability as ability and otherness as likeness; the story of Dialogue Social Enterprise, creator of the ‘‘Dialogue in the Dark’’ experience. How Specialisterne (Specialist People Foundation) is transforming autism from a handicap to a competitive advantage. Reconnecting the mentally ill with society and vice versa, La Colifata uses a weekly radio show broadcast by the patients as the link. The effectiveness of Roots of Empathy in ending aggressive behavior among children. Building widespread public support for interfaith youth work on University campuses; embracing the mission of the Interfaith Youth Core. How Alrowwad creates a space to express normality in conflict zones.